You can listen to the songs here. Couple of youtube links and full musician credits at the end. Vaathe Poothe is a lot like Neram’s Pistah (that is once again in the news for its IPL campaign association) – an ambient techno backdrop with heavy folk percussion, lyrics that don’t make a lot of sense and an immensely addictive end product (incidentally quite similar to this song too, as @youdontknowwho_ pointed out). Special props to the super energetic job from Vidhu Prathap and composer/lyricist Sooraj S Kurup behind the mic. Sooraj does a more imaginative fusing of folk and electronic elements in the uncharacteristically dark pooram song titled Pooram Kaanaan. The singing by Vijay Yesudas and Sithara Krishnakumar is on point, but the arrangement is king here. Sooraj does vocal honours for yet another brilliantly orchestrated piece, Kannukal Kaalidari. Lyrically a romantic track, but the composer opts for a punchy packaging, gradually building the song up to a tumultuous crescendo of electric guitars (Sumesh Parameshwar) and heavy percussion. Adding to the allure is the use of backing vocals and the rare touch of softness that features Sumesh doing Carnatic style guitaring. Guest lyricist BK Harinarayanan pens Pularkaalam Pole, one that Haricharan and Madonna Sebastian totally rule with their singing. Composer chooses Carnatic flavour for this one, punctuating the atmospheric soundscape with a delectable combination of naadaswaram (OK Gopi), violin (Francis Xavier) and carnatic/folk percussion (Sreenivasan R). Are Tu Chakkarr features a dark, Middle Eastern-tinged sound, once again with some infusion of Kerala folk elements. Not particularly fresh, but it works for its frenetic pacing and the passionate rendition by Sachin Warrier and Hesham Abdul Wahab. Vineeth Sreenivasan heads the final song of Valleem Thetti Pulleem Thetti, the poignant, slow-burning Enno Kaathil (reminded me at times of Insaaf from Talvar). 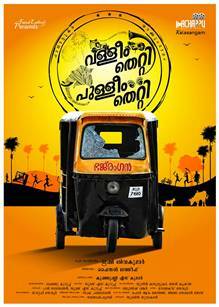 Vineeth is fab, and the arrangement nicely – albeit in a familiar fashion – builds up to that rousing finale.